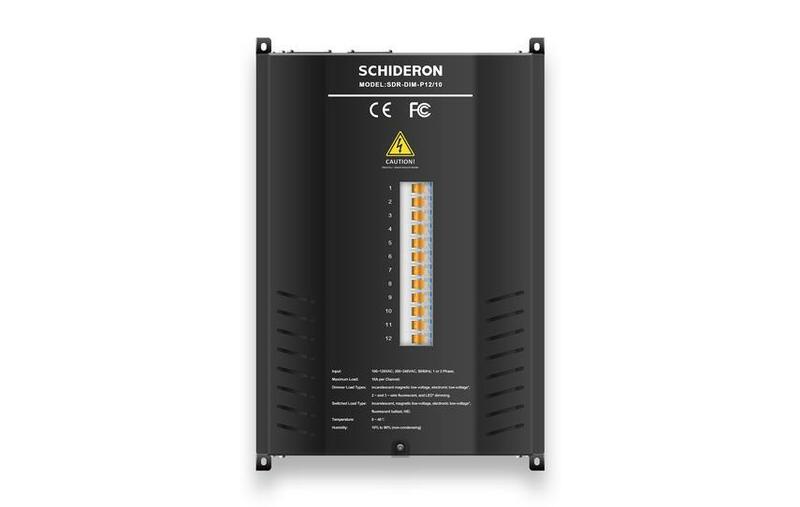 SDR-DIM-P12/10 is a 12-channel high-power thyristor dimming device for electronic low voltage (ELV), incandescent (INC), neon/cold cathode (Neon/CC), and electromagnetic low voltage. Lighting fixtures such as lamps (MLVs) perform leading-edge phase dimming control. The maximum single-channel load current of the device is 10 amps. Unlike ordinary dimming modules, professional dimming boxes require a higher level of work environment and must be ventilated and dry. When installing, there are special requirements for the connection of the device to the load and control terminals. The independent lighting control, pre-editing scene control and scene timing control can be performed through the intelligent lighting management system (LMS) visualization. The device data can be uploaded to the intelligent lighting management system (LMS) for device state management and data statistical analysis, and the entire data transmission and equipment Control meets the latest industrial industry standards.